If you leave Paris St. Lazare train station at 8:50 tomorrow morning, you'll be walking the cobblestoned streets and admiring the colorful half-timbered buildings of Rouen an hour and eleven minutes later. While I would like to say that Stéphane and I went to the historic capital city of Normandy with a well-developed plan, we didn't. We only had a vague notion of what we hoped to see - the cathedral famously painted by Claude Monet, the astronomical clock dating back to the 16th century, the Joan of Arc Tower where Joan was questioned before she was burned at the stake for wearing men's clothes and claiming that God had spoken to her and The Museum of Flaubert and the History of Medicine, if there was enough time. Instead, Stéphane and I, who had made the mistake of driving to Rouen, spent a good half hour circling the city looking for a parking spot. While this allowed us to get a general idea of where the monuments were located, it also lead us to mistakenly believe that we were at Monet's Notre-Dame Cathedral when we were actually inside the more impressive Abbey Church of Saint-Ouen. Fortunately, the friendly woman at the information desk recognized two lost souls and supplied us with a city map and advice on what to visit next. Equipped with a plan, we made our way to the Aître of St.-Maclou, a somber courtyard surrounded by half-timbered buildings decorated with macabre carvings of skulls, crossbones, spades, sickles and hour glasses. When the Black Plague decimated three-quarters of the local population in 1348 and wiped out two-thirds of Rouen's citizens in the 16th century, the courtyard served as a temporary cemetery. Later, the bones were exhumed and stacked in the ossuary. The cemetery was closed by royal decree in 1781 and the area was designated as an historical monument in 1862. Currently, it's the Regional School of Fine Arts. As so frequently happens in Normandy, Stéphane and I sought refuge in a café when the ominous grey clouds fulfilled their promise of rain. One of these days we'll remember to carry umbrellas, but until then we seem to have remarkable luck in stumbling across places like Ici & Ailleurs. Located at 31 rue Damiette, the cozy café/tea room offers the additional advantage of being a bookstore with comfortable chairs and games for customers to play. The free wifi also came in handy when Stéphane's and my English Scrabble game played on a French board became contentious over the validity of the word, "VET". Even though the next stop on our agenda was ostensibly Notre-Dame Cathedral, we meandered down narrow medieval streets, dawdled in antique stores and peered through a milliner's window. The streetlights were just starting to twinkle by the time that we made it to the Tourist Information Center on the Place de la Cathédrale. When the travel advisor recommended that we stay for the 10:30 pm illumination show projected onto the cathedral, we were tempted to book a hotel for the night. There was still so much that we wanted to see, including the "Dazzling Reflections" exhibition at the Rouen Museum of Fine Arts. But after promising each other to return, Stéphane and I headed for home. Maybe you'll see us on the train to Rouen tomorrow morning! Additional photos posted on "Out and About's" Facebook page. The New York Times article: "Near Paris, a City of Flaubert and Joan of Arc"
It's about 1.5 hours by train if you catch the express. It's a very walkable city once you get there, too - though I'd recommend taking a cab up from the train station. I really enjoyed Poitiers too! I didn't realise Rouen was so close to you on the TGV (all roads lead to Paris and all that). I've never been to Normandy, it looks lovely! @Amanda, Thanks for mentioning Poitiers! I've been intending to go ever since I read about the Eleanor of Aquitaine connection on Gwan's (below) blog. Also, many thanks for suggesting La Serrurerie for afternoon tea. That will save me from scouring the internet looking for a place to eat before I go. If you have any other tips for Poitiers or elsewhere, please let me know! @Gwan Taking the TGV to visit you in Tours was a real eye-opener because it was a surprise that it's so much faster to go places by train than by car. One question, does the road from Metz lead to Paris? I sure hope so! Many of the things Gwan recommends on her blog are excellent: Notre Dame la Grande holds a special place in my heart, as I used to go to mass there on Sundays, despite being more or less agnostic and certainly not Catholic. (I was billeted with a group of nuns by my university, and they were marvelous and took me everywhere.) The cathedral is interesting, very different architecturally than the Gothic cathedrals of Paris. The Palais de Justice is wonderful and you can see part of the old Roman wall that encircled the heart of the city in the courtyard outside. Going inside is a must as well, it was Eleanor of Aquitaine's court palace and you can imagine what it was like full of life. The Baptisere St. Jean is wonderful and incredibly historic - it's the oldest Christian structure in France, I believe. If you are looking for a time of year to go, there is (or was) a music festival in early fall, I believe September, and about that time they are still projecting colored lights onto the front of Notre Dame La Grande to show what it looked like when it was first built. It's quite unusual inside as well, with the painted columns. Regional delicacy to try: Torteau Fromage, an amazing cake that I miss still, after nearly ten years. Here's a good blog post explaining it: http://kitchen-at-camont.com/2010/03/30/tourteau-de-chevre-a-goat-cheese-treat/. Oh lovely...definitely a place to check out next time I'm in Paris! I think Rouen is a city that you would really like, Bridget! There's lots of history to make it interesting, narrow streets and half-timbered houses to make it picturesque and really good food. While reading about it before we went, I noticed that many people spend their vacation there and make occasional day trips to Paris! I didn't realize Rouen was so close to Paris by train (duh). We drove around, rather than through, on our way to Normandy. Thanks for opening my eyes to another place I "need" to visit! 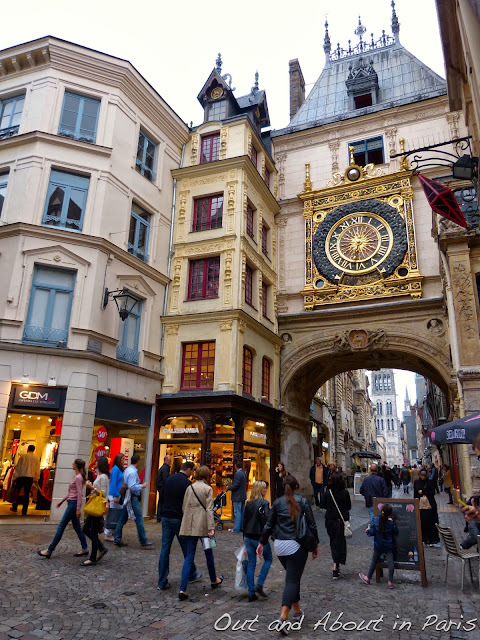 Rouen is well worth a visit, Anne! Many people, including Parisians, don't seem to realize how close it is to Paris. Before writing this post I had to re-confirm the amount of time it takes to get there by train because Nancy's (who commented below) "Paris Greeter" was very skeptical when we told her that it's a little more than an hour. 1 hour and 10 minutes is about the fastest that you can get there and 1 hour and 30 minutes is about the longest. On a slightly different topic, I recently saw that they've started offering English language classes to French commuters on the Rouen-Paris train. Glad that you made it back, albeit without me! Looks like a train trip there is in my future. We haven't made it back to Rouen yet, Nancy! I'm just way behind with my blog posts. This was about Stéphane's and my visit at the end of September. Lovely photos thank you! Rouen is lovely.and a must for Flaubert fans. A vintage postcard reminded us so strongly of Felicite of the Simple Heart we bought it, we also visited Pont l'Eveque to see her home for ourselves!